Fifteen years ago, annual reports began as resource bulletins. These previously printed documents are now delivered as PDFs. 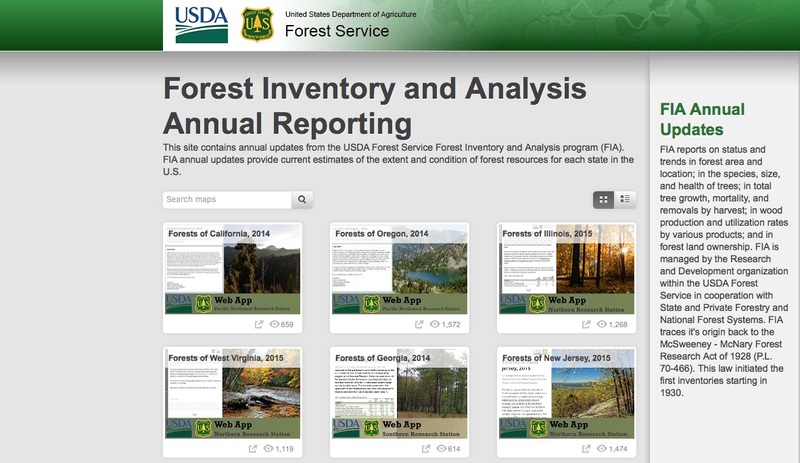 At the 2016 Society of American Foresters National Convention in Madison, Wisconsin, the FIA Program unveiled 10 FIA annual reports as story maps with interactive maps, charts, and graphs. “We’ve been producing annual reports for a long time, but how do we make them more meaningful, not just rote documents? How can we reach new audiences and explore new ideas?” asks Charles “Hobie” Perry, research soil scientist with the U.S. Forest Service Northern Research Station. Taking an annual report and transforming it from a PDF to a story map may seem like a small step, but for these scientists, it’s all part of a larger vision of a science platform that reimagines the process of conducting scientific studies and delivering results in new and meaningful results. “It’s allowed all of us, and especially the analysts who are often stuck doing routine analyses, to unlock our creative and imaginative selves and help us envision a more interesting future,” says Christopher Oswalt, research forester, Southern Research Station. Don’t miss seeing these powerful Story Maps at the American Geophysical Union Conference being held December 12 – 16, 2016 at the Moscone Center in San Francisco, California. Hobie Perry from the U.S. Forest Service will present their visually compelling, interactive and information-rich Story Maps on Monday, December 12 in the post hall from 8:00 a.m. to 12:00 p.m.